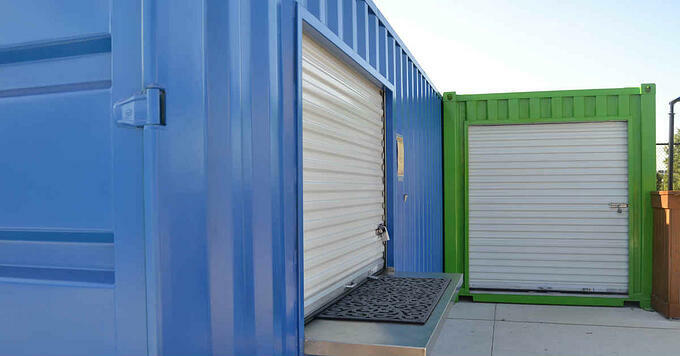 Two of the most popular modifications we make to storage containers in the Austin and San Antonio markets is to add an extra door. The two types of doors that are most popular are roll-up doors and personnel doors. Let's take a look at some of the benefits of each type of door. Both style doors can be installed anywhere in the side or end wall of your storage container. Roll-up doors come in various sizes from 6' to 10' in width and can be handy when loading bigger items into your storage container. Personnel doors are very secure and easy to operate so it makes getting in and out of your storage container very easy. You can't go wrong with either style door, they both offer an alternative entry way into a storage container and can be very handy in 40-foot containers because they will allow you to access materials that may be buried behind other things.